The June 16th posting stated "Two prominent Republicans are running for the senate seat in the August primary – Steve Lonegan & Somerset physician Alieta Eck. Both have been subjects of postings on RTE in the past & would be excellent." Mr. Lonegan has run for governor of NJ twice – most recently as the primary opponent of Chris Christie in 2009. I don't know one subscriber to RTE who did not vote for Steve in that primary. I know Steve Lonegan, have voted for him every time I could, & have endorsed him to many people over the years so it takes a very special candidate for me to endorse them in the primary race against Steve. Most of the doctors in NJ who are subscribers know Dr. Eck & have sent me information re her work. One of our doctors went to high school with her so her qualifications are nothing new. After the aforementioned June 16 posting I also received comments from subscribers familiar with Dr. Eck's work. Earlier today I spoke to Dr. Eck who made a firm commitment to me that she will sign on as a cosponsor to S 122, The FairTax Act of 2013 if she is elected. 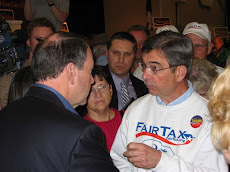 Mr. Lonegan has not made that commitment so if you want the FairTax you will get in with Alieta Eck if she is elected. 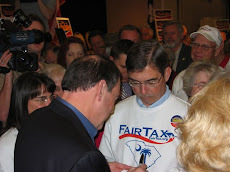 To hear Alieta Eck interviewed by my friend Dave Corsi please click here - she covers the FairTax & so many other issues consistent with the values for America presented on ReturnToExcellence over the years. Based on all of this I endorse Alieta Eck to be the next U.S. Senator from NJ. If after you do your own research this makes sense to you please vote accordingly on Tuesday August 13 in the special primary election. I will be happy to answer any questions – just let me know. Doug, you might have the most qualified person running for office, but without name recognition that person loses, as shown by recent election returns in NJ. In order to get elected, that person has to be seen and heard by the public, not once but many times. I am sure you agree, maybe you do not. If a majority of voters do not know what your message is you cannot win. Doug - Now that the primary is over, what will you do for this special election? Either we advance the ball toward eliminating the IRS etc. ....or just allow the downward slide to continue. I was approached by a friend of a potential candidate to oppose Frank Pallone. The potential candidate is Hari Kishan, whom Pete Sessions encouraged to run. Meanwhile, you may be interested in the Campaign for Primary Accountability, http://campaign4primaryaccountability.org/. The purpose of the Campaign for Primary Accountability is to unseat incumbents of either party who have been in Congress for too long and are unaccountable. The strategy is to find a candidate in the same party who is competitive. The turnout in primaries is low, and a challenger has a better chance. We have learned that a Republican has almost no chance running against Pallone in a general election, no matter how well qualified. But if a qualified candidate can run in a primary, Leo Linbeck III, son of Leo Linbeck Jr. who recently passed on, can send some funding his or her way. Leo III has specific criteria, but if his criteria match a challenger to Pallone, then Pallone will have an entanglement to deal with from his own party. 2) Have Tea-Party members and other conservatives, libertarians, and readers of this blog, who live in the Sixth Congressional District of New Jersey (Pallone's District) re-affiliate as Democrats. They have to affiliate 55 days before the next Primary election. They can affiliate back as soon as the primary election is over. Imagine Anna's Army, as Democrats, hollowing out Pallone from the inside and making him commit resources to a primary challenge!